Mouser Electronics Inc. and celebrity engineer Grant Imahara today released a new video introducing All Things IoT, the latest series in Mouser’s award-winning Empowering Innovation Together™ program. In this new video, Imahara and Mouser delve into the Internet of Things (IoT) — the technological revolution that is reshaping our homes, workplaces and cities, while also fundamentally redefining how we think about communication, productivity and safety. 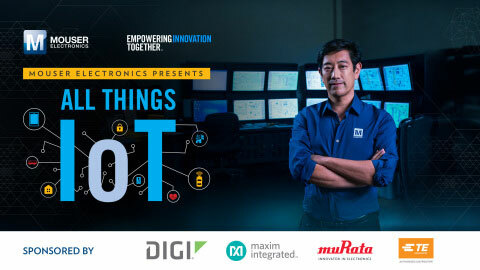 The All Things IoT series is sponsored by Mouser’s valued suppliers Digi International, Maxim Integrated, Murata and TE Connectivity. The video explores the complexity of an “All Things IoT” life, starting with how we could maximize every square inch of our homes and make them smarter. The video begins with an example in a smart tiny house, a trend gaining enormous popularity to combat urbanization’s effects on housing affordability and energy efficiency. Imahara and Mouser discover how home automation can provide more comfort in smaller spaces while lowering energy costs. “IoT and Industrial IoT will be true game changers that save time and significant amounts of money for individuals and companies alike. I anticipate that most every home, office and city will be fully connected in our children’s lifetimes,” adds Imahara. The All Things IoT video showcases Imahara’s visit with Gerald Kleyn from the Hewlett Packard Enterprise (HPE) IoT Innovation Lab. Together, they look into the lab’s innovative case studies that examine how IoT is impacting our workplaces and cities as a whole. In the first example, a power company installs millions of smart meters in Houston to sense and track service and find potential threats to the system. The second case shows how a petrochemical company runs “The Refinery of the Future,” demonstrating increased efficiency and safety based on IoT enhancements. Since 2015, Mouser’s Empowering Innovation Together program has been one of the most visible and recognized programs in the electronic component industry, featuring the future of human-machine interaction in Generation Robot to the amazing benefits of technologies that are Shaping Smarter Cities. For 2018, Mouser’s goal is to reach even more innovators around the globe with the Empowering Innovation Together program, focusing on how robots impact humanity. To learn more about this and the rest of Mouser’s Empowering Innovation Together series, visit www.mouser.com/empowering-innovation and follow Mouser on Facebook and Twitter. To watch the new video, go to https://youtu.be/tKxvycCR6lM.